The Courses menu will help you and others navigate to posts related to individual courses. But for this to work as expected, you will need to apply the right categories to each of your posts. When you make a new post, you need to assign it a category. On the right side of the new post window, you will find a box where you can select the right course category. Categories are hierarchical. 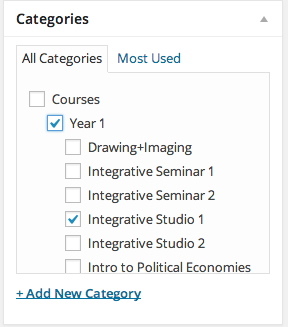 What that means is that the category “Integrative Studio 1” is listed under the parent category “Year 1,” which, in turn, is under the parent category “Courses.” This helps to organize the categories and make them easier to find when you are making a new post. To make full use of course categories, be sure to check the box for the individual course as well as the year in which it is listed. You will notice that at the very bottom of the Courses/Year 1 menu is a link to “All Year 1 Courses.” This will yield results only if you check the “Year 1” category when making your post. 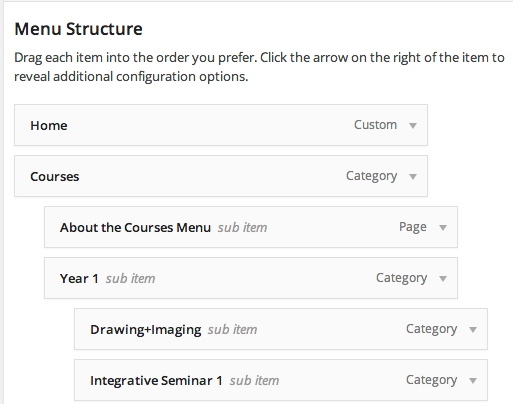 After adding a new course category, you will also need to add the category to the Courses menu. Like categories, menu items are also hierarchical. That’s what causes them to be organized in drop-down menus. The Menus tab is found under Appearance in the Dashboard. Currently, the Courses menu contains a link to each of the courses that might be taken by a first-year BFA or BBA student at Parsons. Depending on your degree program, you might not be taking all of these courses in your first year. If you are certain of that, you should remove those courses from the Courses menu and delete the corresponding categories. Instructions for adding or removing menu items can be found here. Finally, once you have learned to do all of this, you should remove this page from the Courses menu.